Baron Blitzkrieg shows his fuehrer on the operations that he has overseen in his absence before bringing BrainiApe to the scientists working on their current objective. He orders for the Omni-Pulse Cannon to be explained to their leader and is punched to the ground. BrainiApe has grown fed up of Blitzkrieg acting as if he is still in charge. He then hears about how the weapon will remove SuperPatriot’s ability to control his cybernetic limbs which will leave him helpless. A poker game is held at the home of the retired Mister Big and the Hornet where the surviving members of the original Liberty League and Dragon gather. The sexist comments made by Jim Pyle regarding his wife cause SuperPatriot to recall a mission from the past. The Liberty League travelled to Lierberheim where Dread Knight had attempted to use the Galactic Globe device to gain global power. The heroes defeat their enemy and at the end of this encounter, Mister Big commented that the Hornet’s role there was relatively minor. This causes SuperPatriot to now vent his disgust at Jim’s actions towards Maggie but she is not as upset as he is and actually enjoys taking care of her husband. 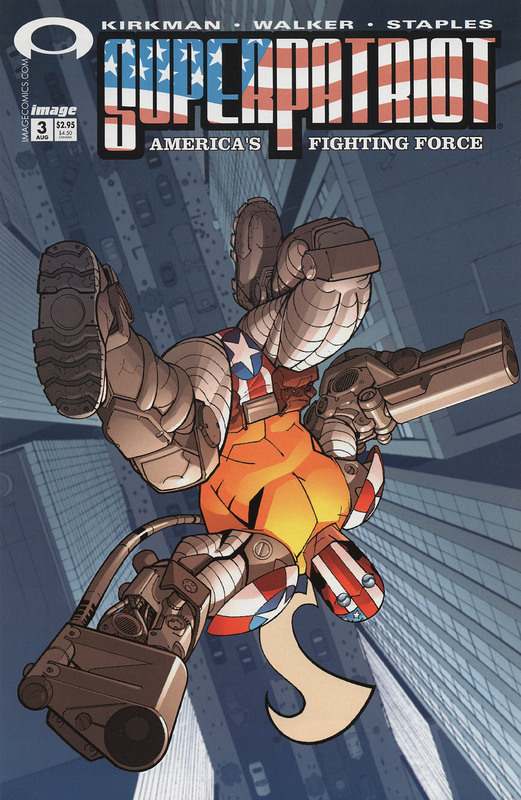 As picks up a paper from the newsstand, SuperPatriot is approached by his son who is extremely worried about Liberty. Justice explains that his sister has not been heard from since the previous night and he cannot contact her. The heroes raid the Freak Outpost to interrogate the super-freaks there for information but they have none to give. Bud Ugly panics at the sight of SuperPatriot and assumes that he is after him, ignoring any words to the contrary and ends up getting apprehended. After three days have passed, Justice learns that his twin has been dating a new man and has just gone to her apartment. He found her boyfriend’s address and the duo race to that location but when SuperPatriot breaks down the door he is shocked by the sight. Liberty had merely been spending a few days in bed with her boyfriend. She is furious about this invasion of privacy and Justice apologizes for their interruption before SuperPatriot and him leave. Baron Blitzkrieg feels unappreciated by his leader after being struck down by him and makes negative comments about BrainiApe to one of the scientists. He is advised not to attempt a coup against their fuehrer as it would be suicide due to everyone siding with BrainiApe. Blitzkrieg later goes to witness a demonstration of the Omni-Pulse Cannon as it deactivates some reanimated zombie troops. Although these soldiers can simply be reactivated, SuperPatriot would suffer a permanent paralysis. In the 1970s, a protest at a power plant ends in violence between the protestors and the guards which causes SuperPatriot to intervene. He takes the side of the guards until the cause of both the fighting and the protests is explained to him. This had been yet another dream of SuperPatriot as he has dinner with Claire Bono. They end up leaving the restaurant early in order to head home to go to bed together.